“The idea was to combine the comfort and on-road ability of a Rover saloon with the off-road ability of a Land Rover.” Charles Spencer ‘Spen’ King – the father of the Range Rover. In the mid ’60s, Rover engineers visited America to garner ideas on how to boost the company’s sales in the US. Dealers there confirmed that a market for 4×4 leisure vehicles was growing. Appealing to those who liked towing, camping and led an outdoor life, but also wanted a vehicle with freeway and urban-driving potential. There were a few big-capacity vehicles, all American. The Jeep Wagoneer, Ford Bronco and International Harvester Scout were spacious, easy-driving station wagons that had selectable four-wheel drive to give some off-road potential, and gutsy engines to give reasonable on-road performance. In Europe, there was no such car. Land Rover engineers evaluated these American vehicles. They offered an interesting mix of abilities. But, in reality, they were nothing like as capable as a Land Rover in the rough, or as relaxing and accomplished as a normal saloon on-road. 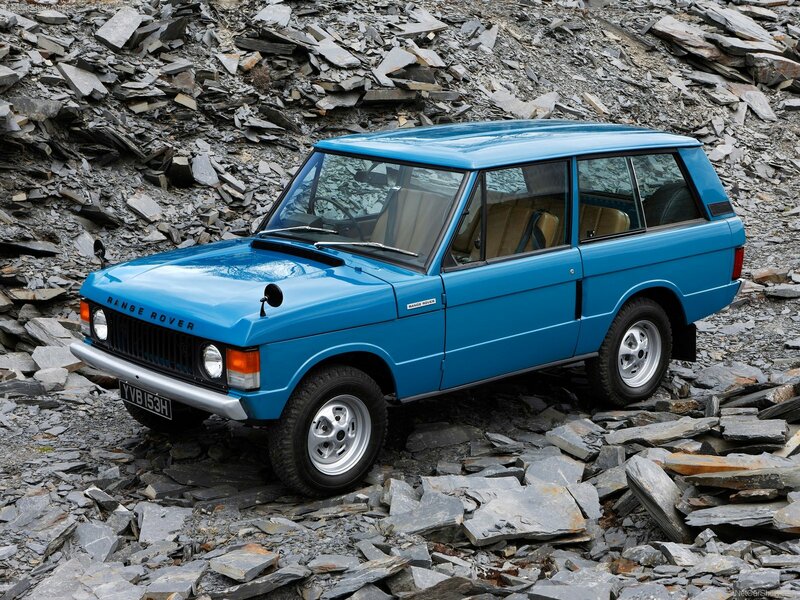 Work on the first prototype Range Rover, then known as the ‘100-inch station wagon’, began in 1966. Range Rover was going to be a premium leisure vehicle, but not really a luxury vehicle. The key quality that gave the Range Rover its road car feel, and its awesome off-road ability, was the long travel coil springs. No other 4×4 had them although a few large American off-roaders had front coils. King insisted the first Range Rover should use coil springs, although it was a move resisted by Land Rover’s engineering department, who generally favoured leaf springs because of their proven strength and durability. In fact, the coils used in the early Range Rovers were the same as those on the Rover 2000 P6 saloon, although the rates were different. Their long travel nature also made for fantastic axle articulation, a big advantage off-road. A rear self-levelling unit maintained handling and ride quality irrespective of load, and helped make the Range Rover an awesome tow vehicle. The Range Rover was also the first off-road vehicle to use disc brakes front and rear, for improved braking power at speed. These were necessary because of the vehicle’s considerable performance: 96mph top speed made it the fastest, and quickest accelerating, 4×4 on the road. The brakes were operated by a dual-line system, to avoid brake failure should one brake line be damaged. The park brake, as with a Land Rover, operated on the transmission. The performance came from the aluminium 3.5-litre 156 bhp V8, a modified version of a Buick/General Motors design. The engine, also used in a Rover saloon, was ideally suited to the Range Rover: it was light, powerful, torquey and mechanically simple. It was allied to a four-speed manual gearbox. There was no automatic transmission until 1982, although one of the early Land Rover-based prototypes had a Borg Warner three-speed automatic shift. The two-speed transfer gearbox gave, in effect, eight speeds. A centre differential allowed for permanent four-wheel drive. Again, this was unique. All other production 4x4s of the time, including the contemporary Land Rover, had selectable 4×4. The centre diff could be locked for enhanced off-road prowess. The full-time 4×4 ensured that the torque could be equally split between front and rear axles, and also crucially meant that those axles could be lighter than was typically the case with selectable 4x4s. There was no need for a massively strong (and heavy) rear axle, which would have damaged ride comfort. The basic shape – flat sides, thin roof pillars, short overhangs, all dimensions including wheelbase, upright nose and tail – was determined by engineers, principally King and chassis engineer Gordon Bashford. The initial press kit didn’t even talk about the design. Those iconic details are all there for a reason, for the Range Rover is a highly functional vehicle. The bonnet castellations improve the driver’s ability to see the corners of the car. They’re helpful in congested city driving, in parking, and when driving off-road. The floating roof is partly an upshot of those comparatively thin pillars, to improve visibility. On the very early production Range Rovers, the roof pillars were body coloured. It was not possible to manufacture these pressings with a suitable quality finish, so the pillars were soon covered in a black ‘pseudo-hide’ finish. The hide boosted the floating roof effect. The comparatively flat sides allow driver and passenger to sit as far out as possible, improving visibility. Those relatively flat sides also improve the driver’s ability to judge vehicle width, important for manoeuvrability on- and off-road. The Range Rover was originally specified with an all-aluminium body. For production, all the panels were aluminium, except for bonnet and tailgate. The bonnet had been redesigned, from the early prototypes, partly to incorporate those distinctive (and useful) corner castellations. It proved too difficult to press accurately in aluminium. So steel was used instead. The original Range Rover had two doors only and a four-door model was launched in 1981. The Range Rover was announced to the world’s media on 17 June, 1970. The first Range Rover sales brochure spoke about the most versatile motor car in the world. At launch, the target audience had been carefully considered. The brochure said they were business and professional people with a leaning towards the great outdoors, who want a purpose-built vehicle instead of an adapted one, the real thing instead of a compromise. The press kit called the car the Range Rover Station Wagon (though the station wagon tag was soon dropped). In the 1970s, the vehicle changed very little. By the 1980s, the pace of development picked up, mostly to make the vehicle more luxurious. Cabin trim was regularly upgraded, and carpet, leather upholstery and wood trim elevated the Range Rover into a viable alternative to luxury saloon cars. The 3.5-litre aluminium V8 was enlarged to 3.9 litres in 1989, and then to 4.2 litres in 1992, improving performance and refinement. The three-speed Chrysler automatic gearbox – first available in 1982 – was replaced by a smoother and more efficient ZF four-speed in 1985, further broadening appeal. The Range Rover was fitted with ABS system in 1989. Land Rover engineers had been working on developing ABS for five years. The problem was that slippery surfaces and bumpy rocky ground upset early prototypes. A solution was found, and ABS was offered as standard on the top-line model from 1989, and was optional on lower-trim versions. In 1992, the Range Rover Classic was fitted with electronic traction control (ETC). Initially fitted on the rear axle only, but soon after extended to all four wheels, ETC gave a big boost to the vehicle’s off-road ability, by transferring torque to the wheel offering the most grip. It also improved on-road safety. A long wheelbase version, the LSE, featuring height adjustable electronic suspension came out in 1992, a few years before the launch of the next Range Rover. The Range Rover Classic, the first generation of the luxury 4×4 stayed in production for over 25 years before it was replaced by the second generation, known as the Range Rover P38A.